Good advice! Nicodemus was saying, “Let’s not condemn Jesus until he has a fair chance to defend himself.” Likewise, before we condemn the Mormon Church, let’s give them a fair chance to defend themselves. Jesuschrist.lds.org may provide the quickest way to learn what their most basic beliefs are. At mormon.org you can order a free copy of the Book of Mormon, their most well-known “scriptural” book. An honest reading reveals remarkable agreement with the Bible. In fact, it actually makes their doctrine overall look better than it actually is because virtually none of their false teachings can be found in it! LDS.org has loads of intelligence, as does BYURadio.org. Fairlds.org is a pro-Mormon foundation created to counter misrepresentation and criticism of the LDS. One LDS book I particularly recommend for the researcher is Gospel Principles (available for download at The Church of Jesus Christ of Latter-day Saints website). 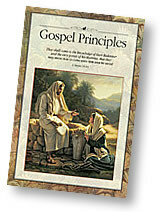 Gospel Principles is used in Sunday school classes in local Mormon congregations across the country. It is a well-balanced survey of their major teachings, both false and true--it doesn’t make them look better or worse than they really are. Researching the LDS with Gospel Principles is definitely more responsible and Christlike than trusting a misguided con-Mormon non-Mormon! Aside from getting to know Mormon Christians and seeing for yourself the fruit of their faith in the Lord Jesus Christ, the next best tool may be to read real stories from their lives. One Mormon mom tells about a non-Mormon named Darren who didn’t know there was a bullet in the chamber of his revolver until . . . [read entire story]. Mormon Stephen E. Robinson doesn’t claim to speak officially for the LDS in his book, Are Mormons Christians? But he seeks to equip his own Latter-day Saints to refute the charge that many of them find puzzling--that LDS folks aren’t Christians. In November of 2004, a leading evangelical spoke to LDS people at the historic Mormon Tabernacle in Salt Lake City and said evangelicals have spread lies about LDS beliefs. Dr. Richard Mouw, president of Fuller Theological Seminary in California, one of the largest multi-denominational seminaries in the world, confessed, “We have sinned against you.” Functioning as a wise, tactful, gracious, bridge-building reformer, Mr. Mouw then uttered something even more significant. He said he took encouragement from what Mormon founder Joseph Smith proclaimed at the occasion of the founding of the Mormon Church in 1830. Get ready, my friends, to feel the presence of God as you read Joseph Smith’s words as quoted by Mr. Mouw: “We know that all men must repent and believe on the name of Jesus Christ, and worship the Father in his name, and endure in faith on his name to the end, or they cannot be saved in the kingdom of God.” Read the whole story on Beliefnet. To read the entire transcript of the Osteen interview click here. (Note carefully: He certainly wasn’t approving of Mormon false teachings.) Osteen is the beloved pastor of the largest church in the U.S. He is also the charismatic (pun intended) minister of a worldwide broadcast media ministry. Although I haven’t read it, I’m excited about Robert L. Millet’s controversial book A Different Jesus? The Christ of the Latter-day Saints. It’s an evangelical source even though it’s written by a Mormon because it’s issued by an evangelical publisher! The Millennial Star says A Different Jesus? apparently has the evangelical community in a tizzy. 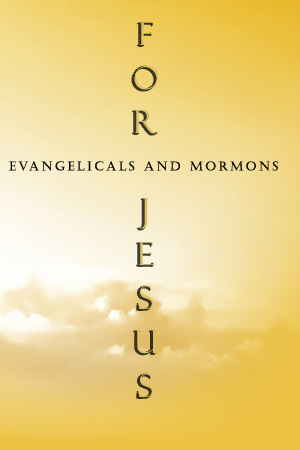 Containing a foreword by a respected evangelical, this book was written by a Mormon who, according to Deseret Book Co., has “spent much of his career in conversation with traditional Christians and their writings.” Without trying to persuade, Millet discusses how the Latter-day Saints fit or do not fit within mainstream Christianity. One section valuable for researchers (like you!) answers frequently asked questions about Mormonism. A Different Jesus? 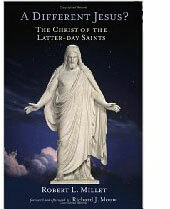 The Christ of the Latter-day Saints is available inexpensively at Amazon, as is Millet’s more recent Claiming Christ: A Mormon-Evangelical Debate, which is an in-depth doctrinal comparison of Mormonism and evangelical Christianity. Another such comparison comes from How Wide the Divide? A Mormon & an Evangelical in Conversation by Blomberg and Robinson. The back cover states, “Unfortunately, much of what [Mormons and evangelicals] say about one another simply isn’t true. False stereotypes on both sides prevent genuine communication.” According to Amazon, this 1997 pioneering book How Wide the Divide was voted one of Christianity Today's 1998 Books of the Year. Non-Mormon Paul Conkin wrote American Originals: Homemade Varieties of Christianity (1997). A long chapter on the LDS focuses on their history, as well as their unique beliefs. Extensively researched, it is remarkably unbiased. Copyright © 2008 Cal Fullerton. Permission is granted, and you are encouraged, to print the above article in hard copy form, as well as send it to your own email lists and post it on your own websites. We only ask that you include the name of the originating website (EvangelicalsandMormonsforJesus.com) and this copyright and permission notice. By providing links to other sites, EvangelicalsandMormonsforJesus.com does not necessarily guarantee, approve, or endorse the information or products available at these sites, nor does a link indicate that the linked site is associated with or endorses EvangelicalsandMormonsforJesus.